I don’t mind washing. I’m not saying it’s my favourite activity you understand but it has it’s compensations like seeing my favourite quilt swinging on the line in the sunshine. Oh, my, what a mess! You are right about luck, though. It would have been so miserable if they had pooped on that beautiful quilt. It is lovely, and looks so nice hanging on the line like that. Oh, you made me smile early this morning. And yes, you should play the lottery with so much bird poop luck! Sooo sorry to hear about the POOP. Thankfully the gorgeous quilt was missed. But it is still a horrible thing to have bird droppings to clean out of fabrics. Grrrrrrr! The quilt is fabulous. Is that your pattern or is it a commercial pattern? I would love to make one like it. Thanks for having a blog that I like to see in my email box!!! Thanks for commenting. 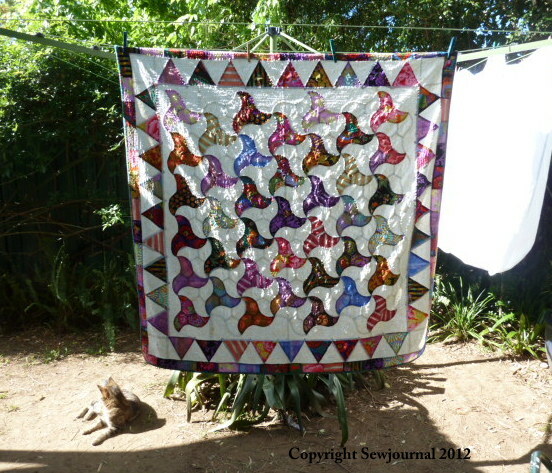 The quilt is one I designed myself based on Andalusian tiles. It is hand-pieced and hand-quilted. Thanks for subscribing to my blog and please keep commenting I really like the conversations that get going here.